The Royal Commission turns its attention to superannuation on Monday as it kicks off two weeks of public hearings in Melbourne. After the fireworks of previous hearings it promises to an engrossing fortnight. Formally, the inquiry is scheduled to examine how responsible superannuation entity licensees “fulfil their duties to members of regulated superannuation funds and the extent to which structural or governance arrangements may affect the fulfilment of those duties”. It will also examine how superannuation is sold; the relationships that exist between financial advisers and trustees; the effectiveness of APRA and ASIC as regulators; and how super funds engage with their Aboriginal and Torres Strait Islander members. And all of this is to be done through the royal commission lens of examining where “any conduct, practices, behaviour or business activities…fall below community standards and expectations”. Before the public hearings of the royal commission got underway in March, CoreData research found that trust in superannuation was greater than in banking and in financial advice. The trust rating is the percentage of people who rate trust in a sector as six or higher on a scale from zero to 10, where zero means complete distrust and 10 means complete trust. A score of six or higher means they consider the sector more trustworthy than untrustworthy (see chart). Both of banking and financial advice have had their moments in the spotlight and trust in both has declined markedly. Now it’s superannuation’s turn. 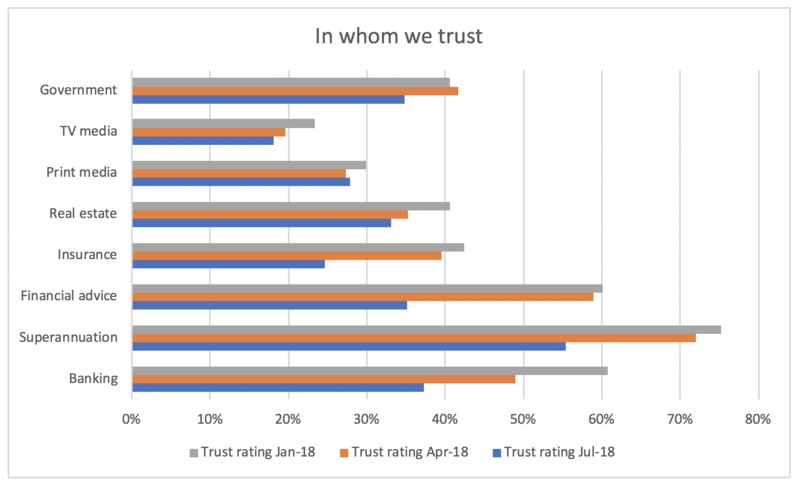 Already a kind of “mistrust contagion” has affected the sector, with trust in super declining by 20 percentage points since April, but even so, as the hearings get underway it remains the only sector trusted by more people than it is distrusted by. After banking, superannuation is the sector of the financial services industry that touches more people than any other. Super funds are at the forefront of the drive to make more Australians financially self-sufficient in retirement, through the accumulation of wealth through their working lives; they are increasingly also on the frontline of providing advice to members on the transition from working life to retirement, with all of the financial complexity that entails. It is critical that all funds operate fairly, honestly and openly with members, and at a level that meets or exceeds community standards and expectations. A background paper published by the inquiry last month says about 14.8 million Australians have at least one superannuation account and 40 per cent of people have more than one. Figures published by the Association of Superannuation Funds of Australia, based on APRA data, show at as at March 30 this year there were a total of 27.5 million member accounts (not counting self-managed super funds). These accounts, in 224 retail, industry, corporate and public-sector funds, had assets totalling $1.8 trillion, not including the balance of life company statutory funds. More than $25.5 billion of new money rolled into the sector in the March quarter, in the form of Superannuation Guarantee (SG), defined-benefit and personal contributions, plus salary sacrifice arrangements. About $1.3 billion flowed out to SMSFs; and lump-sum benefits and pension payments totalled about $17.5 billion. About $4 billion was taken out as earnings and contributions taxes. And $1.66 billion was eaten up by “operating expenses”. Superannuation is a big, complex and sometimes opaque industry for consumers, with plenty of vested industry interests keen to ensure their respective patches are protected. Some of these arrangements will be in the sights of Commissioner Ken Hayne and his counsels assisting in the coming days. No fewer than 26 witnesses have been granted leave to appear over the next two weeks and the inquiry has established that it’s not of a mind to go easy on anyone it chooses to examine. 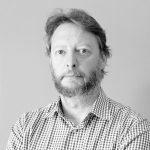 Last week an individual who’d spent time in the witness box during an earlier public hearing described it as the worst experience of their professional life. In the next fortnight others may come to understand what that means.